Sorry I am missing in Blogland. I have been busy designing more blogs. With the new year, most people wanted a change. 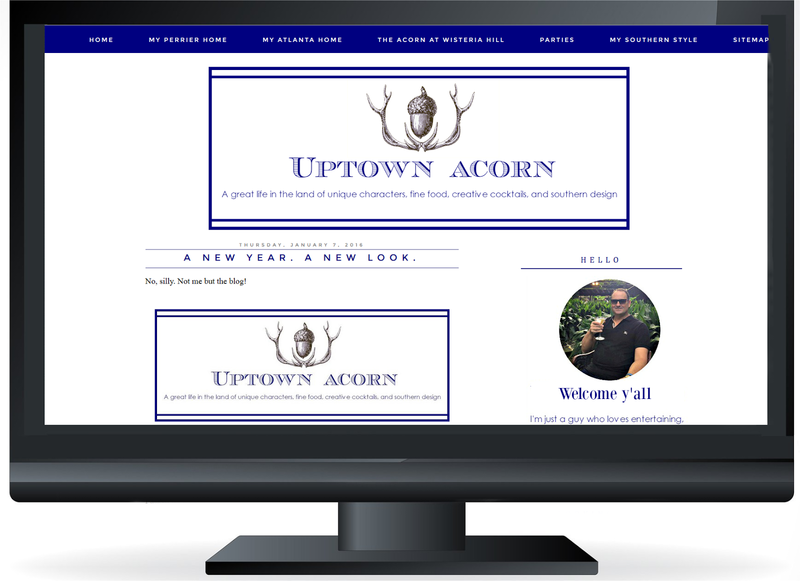 Ron from Uptown Acorn wanted a clean, fresh new look for 2016. I updated his whole blog with navy blue and white. It's so clean and minimal looking. It loads faster as well. Ron manages to keep me busy, either designing a change of headers or collages for the different holidays. Thank you Ron for the opportunity. He is so fun and easy to work with. Be sure to drop by and see his new look and say hello. Liz also wanted a little different look. I had made her blog over for Christmas. She was ready for a new header. She wanted soft and feminine. Liz is a wonderful person who loves to decorate. Liz and I have been friends for years. We haven't met in person, but w e keep in contact. We met on Rate My Space from HGTV. Lastly I am working on Valerie's blog. Her blog is Candlelighsupper2. I am finishing it up . Here's a glimpse. Valerie wanted something clean, but soft and elegant. Valerie does beautiful tablescapes. I am pleased to give her a look to showcase her lovely tables. I shall visit your blogs and do a post as soon as I get settled here. I hope the new year is great one! You always do a beautiful job updating blogs...I love these!! You're so generous with your time and talent, Linda. We all appreciate your creativity and knowledge. You are such a creative and kind person. 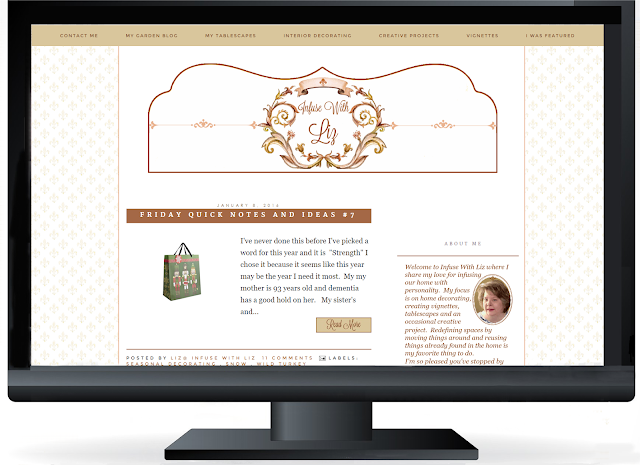 I always love the makeovers you give my blog as well as the updates that keep it current. I love Ron's new look too! Looks like the Candlelight Supper blog will be beautiful! I love the simple clean designs you've made to update these blogs-I will stop by and check them out. I wonder if you are getting snow? We still have 6" on the ground; next weekend we will be in Carmel, even though it might rain, we always love the green in Ca. during winter. It is no surprise to me that you are keeping busy. You are top-notch in your field of expertise and have such a easy going and professional manner. Love the look of these blogs-perfect for the new year. Wishing you the best of the best in 2016! They all look great Linda, I'm sure you are much in demand! I just saw that you live in No Cal, I went to CSCU, [Chico] LOVE northern Cal! wow Linda, that's great that you design blogs as well. I really like these Header designs, especially Candlelight Supper. I hope the new year is being good to so far. You are a special lady with many talents. Your designs are lovely, Linda. I must say, your own header is your best advertisement - it is gorgeous. These all look sooooooo good! One of these days I wouldn't mind having mine redone. I like the look of it now, but it's been the same background for awhile now. Well, time has run away from us as the year begins but next week I'll have a little more freedom so I hope we can chat. Loving your beautiful new designs. I popped over to Uptown Acorn and was struck by the beautiful shades of blue and lovely layout. Gorgeous! Next off to visit Liz and Candlelight Supper. You have such a special touch, my sweet friend. Can't wait to chat and laugh with you! You are so creative and do such a wonderful job on everyone's blog, including mine!! Thanks again for alm you do. I will go see the others new looks!